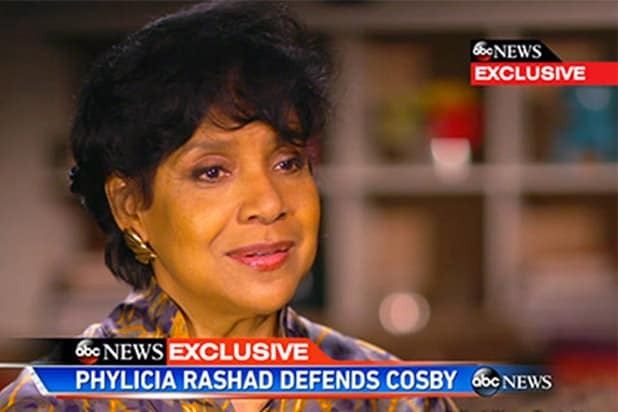 Bill Cosby‘s former TV wife Phylicia Rashad, who sparked outrage with her defense of Cosby on Tuesday night, appeared on “ABC World News Tonight With David Muir” on Wednesday, saying that she was misquoted. Rashad was unable to offer theories about who would want to obliterate Cosby’s legacy. Rashad, who played Clair Huxtable on “The Cosby Show” from 1984 to 1992 and Ruth Lucas on “Cosby” from 1996 to 2000, angered many with an interview published on Showbiz 411 on Tuesday, in which she defended Cosby and dismissed his accusers, reportedly saying it’s best to “forget” them. Among Rashad’s critics: director/producer Judd Apatow, who tweeted that the actress’ defense was financially motivated. “She is worried about her SAG residuals disappearing if they are heard in court. Shameful,” Apatow wrote in a tweet to TheWrap‘s CEO and Editor in Chief. “SNL” alum Norm Macdonald also weighed in on the Cosby scandal, tweeting to Apatow and actor Tom Arnold, after Apatow asked his thoughts on the topic. “My opinion is he is guilty.But I worry about the next guy. I believe social media could destroy an innocent,” Macdonald tweeted. Watch Rashad’s interview with ABC.